Manufacturing growth continues to boom and is forecasted to increase more than it has in a decade. According to the MAPI (Manufacturing Alliance for Productivity and Innovation) Foundation, because of stronger capital spending and export activity, the manufacturing industry has a growth forecast of 2.8% in the next 2 years. With such large growth forecasted, manufacturers should be seeing an increase in business. This means there will be a profound need for daily business processes to be handled differently, so your team can focus on and keep up with the industry demands and growth. A modern Enterprise Resource Planning (ERP) system, such as Microsoft Dynamics 365 for Finance & Operations, can, among other things, help streamline processes, reduce costs, gain a competitive advantage, and – most importantly – help manage your growth. How does the system do that? There are many ways, but in one word: efficiency. Critical information is stored and accessed in a core database, allowing all departments to view, access, and update data in real time. Daily processes and tasks can be automated, reducing the amount of time your team is working to complete them, ultimately leading them to focus on bigger picture tasks, thus increasing productivity. With one source of accurate, real-time information, ERP software can reduce administrative and operational costs. It allows manufacturers to proactively manage operations, preventing disruptions and delays, and helps users make decisions more quickly. As manufacturing organizations grow, their operations become more complex. ERP manufacturing software automates all business operations, providing accurate, real-time information. ERP increases efficiency and productivity by helping users navigate those complex processes, preventing manual data entry, re-entry, and improving functions such as production, order completion and delivery. ERP systems may require an investment, but you could potentially lose way more if nothing is done to help with the industry growth. Manufacturers cannot afford to put off a modern ERP implementation while their competition invests in the technology and begins experiencing the benefits. Modern manufacturing ERP software systems are robust, flexible and configurable. They are not a one-size-fits-all but can be tailored around the unique needs and demands of a business. With the right ERP system, you may be able to integrate your other current systems with your ERP. For example, Microsoft Dynamics 365 for Finance & Operations can easily integrate with Dynamics 365 for Customer Engagement, Outlook, Excel and other Office products, Skype/Teams and more. This integration results in even more business unification. The importance of a modern manufacturing ERP system far outweighs the initial cost and time of implementation. 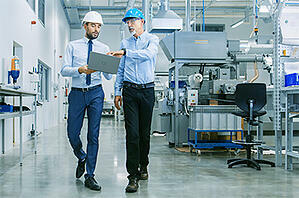 As the manufacturing industry continues to grow, don’t get left behind. Choosing the right ERP system for your business can be challenging but we can help guide you through that process. Contact us to chat with one of our ERP experts and they’ll recommend what’s best for you.